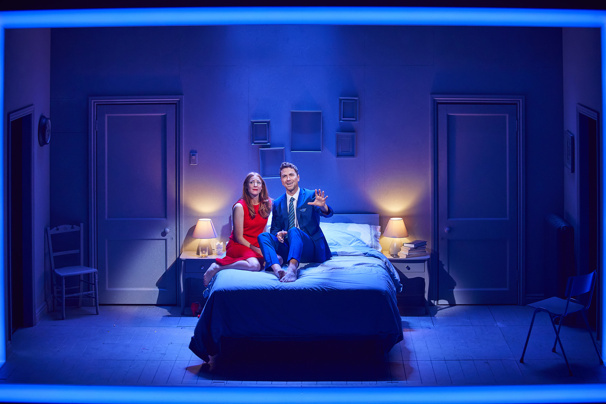 Rosalie Craig and Richard Fleeshman in "Company"
Richard Fleeshman starred on the West End and Broadway opposite Caissie Levy in Ghost the Musical and was part of the British ensembles of Urinetown and The Last Ship. But it’s fair to say that he has never had quite the opportunity offered by the knockout, gender-flipped revival of Company, playing the barely-clothed air steward Andy—a character previously known as April. The winning and funny performance has brought Fleeshman an Olivier nomination: one of nine received by the Gielgud Theatre production as a whole, as the charming Englishman, keen to share the praise, was quick to point out. How did you hear that you were among the nine Olivier nods for this groundbreaking production of the 1970 Broadway classic, Company: the first iteration of the Stephen Sondheim/George Furth musical to recast the central character, Bobby, as a female, Bobbie [played by Rosalie Craig]? You know, I’ve been filming a TV series by day and doing the show at night and wasn’t holding out for a nomination; I think it had definitely just gone over my head when about 1:30PM on that Tuesday I went to the loo and tuned my phone from airplane mode back on and it went mental with messages. As the character formerly known as April, you partner the newly female Bobbie on the wonderful song, “Barcelona”—is that a place you’ve ever been? What’s your take on Andy and Bobbie’s relationship, if you can even call it that? That’s the thing: they’re not strictly speaking together. During the park bench scene, he’s kind of filling her in on his background and Rosie [Craig] and I spent a good hour mapping out how they could have met: Andy welcomes people on the plane into Business Class with a glass of champagne probably because they don’t trust him to do anything else but stand there and he’s quite enamored of her as we see in the show. She’s this very successful, slightly older, very beautiful woman and I think that’s why he’s so daunted. How do you view the defining bedroom scene between Andy and Bobbie, which both you and Rosalie Craig bat out of the park? How did it then feel to find you, as Andy, being the one who strips down to nothing but blue undies and a mic pack? You know, for so many years women have been made to stand in their underwear while the man stays in his clothes so it felt important to knock that on its head. At the first preview, I don’t think I’d really registered what it would be like to stand there in my underpants before a packed house, but it’s become a bit more second nature since then. From what I’ve gathered, what most people want to know is how you maintain your physique. Are you looking forward to a bit of a pig-out after Company closes? In fact the TV show I am doing [a spin-off for the American streaming service Hulu of the much-loved 1994 film Four Weddings and a Funeral] also requires me not to have many clothes on, but once that’s finished, me and the other half are going to go away and eat a helluva lot of chips and drink a lot of beer! Wait: is this disrobing becoming a thing? Did you know that your co-star Patti LuPone refers to you as “the Fleesh” —or at least did so during a hugely engaging public Q&A she did a few Sundays ago? Does she? I just love that woman! So many times the party line on a show is that everything’s great and everyone gets on, but I don’t think any of us have ever meant it more sincerely than on Company< i="">. Apart from how the show has been received, the job itself has been so wonderful to be part of. And the thing with Patti is that every night she’s just brilliant. We all knew that she’s a legend, but I didn’t know how much she would affect me on a personal level. How is everyone feeling as the countdown begins towards the final performance on March 30? I’m not a betting man but I would strongly advise putting some money on it being quite an emotional affair. I think we all feel as if we are approaching the finish line on a marathon that has been such an amazing experience: this is a job all of us are going to remember forever and ever. Is it nice, under the circumstances, to then have the Olivier ceremony a week later [April 7]?